This article looks at the different model export methods, their limitations and the respective Dymola licensing requirements. Whenever a model is translated, an executable file is created, called dymosim.exe. When the model is simulated (run) the dymosim.exe file is executed. This file can be run from the Windows Command Prompt1. The model can be exported as a Dynamic Linked Libraries file, or DLL, with the API given by <Dymola installation directory>/source/dymosim.h3. The parallelisation features of DYMOLA are not supported. Note that this feature will be removed in future versions of DYMOLA and it is recommended that FMI is used instead. A model’s C code can be generated and utilised directly by the user. The user must provide the solver; but an example project in MS Visual Studio is provided in <Dymola installation directory>\binary\export\StandAloneDymosim.zip which contains a Euler solver, and a variable-step solver4. Functional Mock-up Interface, or FMI is an open standard for model exchange and co-simulation5. In Model Exchange Mode, the simulation tool with which the exported model is run, provides the solver. Conversely, Co-simulation Mode includes the solver in the exported model. A toolbox is provided for Simulink that provides an easy way to import DYMOLA models9. The Claytex BuildTools Library can export models as apps that can run on vTAG or PTWinSim (read further at: https://www.claytex.com/products/dymola/model-libraries/vesyma/driver-in-the-loop/). The VeSyMA – Driver-in-the-Loop library provides an interface with the rFpro, professional driver-experience simulation environment, which allows these vTAG or PTWinSim apps to interface with rFpro. However, Linux is not supported. Figure 1: Feature table of export options. *This licence is needed; having a full DYMOLA licence or DYMOLA runtime licence is not sufficient. DYMOLA provides inline integrators that can be used with the Euler solver17. These inline solvers typically increase simulation speed but can be less accurate, which when working with Hardware-In-the-Loop (HiL) in particular, can be a necessary compromise. The Real-time settings are in Figure 2. Figure 2: Real-time setting in Simulation->Settings, the type and order of inline integrator can be selected. A DDE server can be embedded into18 the dymosim.exe Executable. The DDE server can be used to set parameters, start and stop a simulation, and to simulate the model in Real-time. It is also possible to “hot link” to variables, so you read the value of a variable while a simulation is running. Currently only the Lsodar, Dassl, Euler, Rkfix2, Rkfix3 and Rkfix4 integration schemes are supported and only Visual Studio compilers can be used with this feature. Parallelisation features of DYMOLA are also unfortunately not supported. to export a model as a DLL (note that a model exported with embedded DDE or OPC server cannot be exported as a DLL). The dymosim.exe Executable can be compiled with an embedded OPC server19. The functionality is like that of the DDE server except that it uses OPC including a graphical interface provided as in Figure 4. The OPC feature currently only compiles as a 32-bit executable. 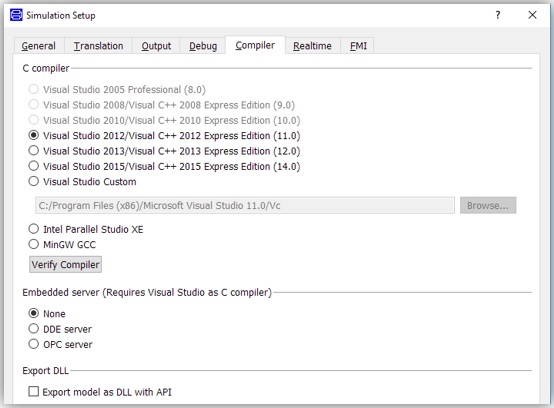 Only Lsodar, Dassl, Euler, Rkfix2, Rkfix3 and Rkfix4 solvers are supported and only MS Visual Studio compilers are supported with this feature. Parallelisation features of DYMOLA are not supported. Dymosim.exe can be run in Real-Time with use of the OPC (only supports 32-bit) or DDE interfaces, as documented in the previous entries. The Modelica_DeviceDrivers library20 provides support to the following IO: UDP, TCP/IP, LCM shared memory, AD/DA converters, serial port and other devices. It is also possible to interface DYMOLA models with external C or Fortran code, so this provides further options for interfacing with HIL test rigs. Similar properties as the “executable” above, however the embedded OPC and DDE server options are not supported so the user would have to control the synchronisation with real-time. Many HIL systems can interface with C code. dSPACE, PLC, AVL testbeds, ETAS LABCAR-OPERATOR, SimWB and others, can interface with FMU’s. Models can be exported to Simulink using the S-Function interface using a DYMOLA Block or the FMI interface. From here, tools can be used to export the Simulink models to dSPACE, xPC and other platforms. DYMOLA models can be exported to the vTAG or PTWinSim Apps using BuildTools Library, which you can learn more about at https://www.claytex.com/products/dymola/model-libraries/vesyma/driver-in-the-loop/. The Simulator Library also provides an interface to rFpro. System Monitor21 and ATLAS22 can be used to modify the parameters setup and to log results for models simulated on vTAG. PTWinSim Monitor23 and Gredi24 can be used to modify the parameter setup and to log results for models simulated using PTWinSim. Below is the list of licenses that are required to run an exported model29. These licenses do not include licenses required by third party libraries30. A Real-Time license is required to use inline integration (mentioned in the “Additional features” Section above). This license is included in the basic configuration shipped with DYMOLA as of the 2017 FD01 edition. Most Functional Mockup Units or FMUs (See Binary Model Export below) and most Simulink models (See Source Code Generation and Simulink interface below) will simply run on a machine that has a DYMOLA (standard configuration) or a Runtime License. Models for use without a full DYMOLA licence must be exported using an appropriate licence. Models exported without the Binary Model Export or Source Code Generation licences will require a full DYMOLA licence to be run. This allows the exported executable, DLL, S-Function or FMU models, to run on another machine even if that machine has no DYMOLA Standard, or Runtime license. This licence is required to create DLL models and to create Co-Simulating FMUs that use DYMOLA solvers. This licence includes all the abilities of the Binary Model Export license. It also confers the ability to export source code that can be used in standalone projects. This licence is required to export models to dSPACE and xPC via FMU’s. This license is also required by the Claytex BuildTools, and Simulator Libraries in order to create vTAG and PTWinSim Apps. 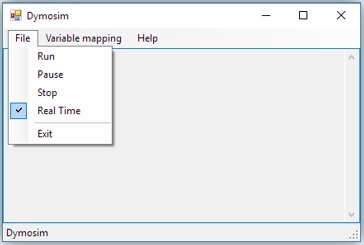 This option is required to export a model to an S-Function for use in Simulink. Together with the Real-Time Simulation license you can compile the model to dSPACE or xPC using Simulink Coder. 15 The Simulink Interface and Real-Time Simulation license is required to create Simulink S-Functions that are to be exported to dSPACE or xPC. 30 Libraries requiring licences are either licensed via the same mechanism as the basic software licence, or by third-parties.